(RNS) — The normally sleepy midterm elections were supposed to be a referendum on Trump and a blue-wave win for the Democrats. Then came Brett Kavanaugh’s confirmation hearings in the U.S. Senate. Suddenly Republican voters were re-energized, as many saw the midterms as the final showdown over the Kavanaugh nomination. In truth, the fight to tell the story of how Brett Kavanaugh got to the high court has just begun. The two colliding narratives that made his confirmation so divisive will be kept alive by our opposing political tribes, each hoping to win the debate over how to evaluate future Supreme Court decisions, particularly about abortion, in which Kavanaugh is now the deciding vote. 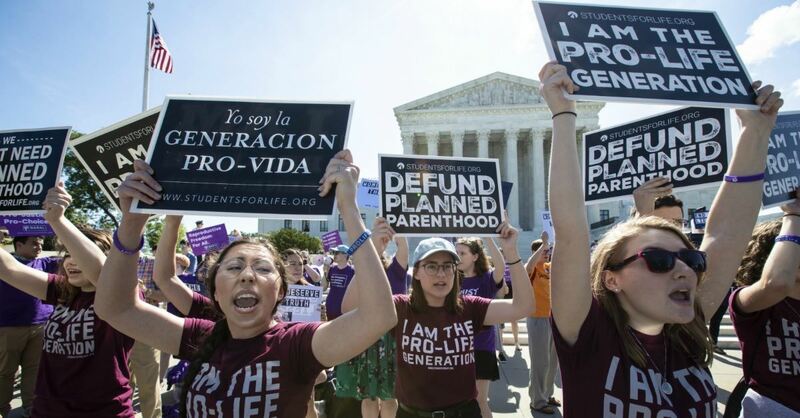 It’s a battle that imperils the Senate and the Supreme Court itself, unless one group in whose name it is being fought can come to the rescue: pro-lifers. To review: The Democratic narrative accuses Republicans of being dishonest in responding to Christine Blasey Ford’s certainty that Kavanaugh was her assailant with condescending conspiracy theories. Republicans swallowed these outlandish proposals while ignoring how their nominee lies under oath. In the liberals’ narrative, the Republicans, who uncritically supported Clarence Thomas, Roy Moore and Donald Trump, will never take violence against women seriously — perhaps because a central conservative goal requires controlling women’s reproductive choices. The Republican narrative, on the other hand, maintains that the hearings were a political kangaroo court. Minutes after Kavanaugh was nominated, Senate Minority Leader Chuck Schumer declared he would oppose the former White House lawyer “with everything I have.” Democrats illegally leaked confidential emails. They threw Ford under the bus by airing a confidential letter against her will. While all women must be heard and respected, Republicans say, Democrats have turned #MeToo into a political weapon by claiming all women must be believed no matter what the evidence suggests. Many Republican women supported Kavanaugh’s nomination because Democrats don’t care about women; they care about political street-fighting and using the Supreme Court to enact their agenda. If Democrats gain control of the House they will conduct sweeping investigations aimed at impeaching Kavanaugh. Senate Republicans, for their part, have promised to continue to investigate the leak of Ford’s letter and even the alleged intimidation of witnesses. Going forward, it’s likely that the party that holds the Senate majority will simply refuse to confirm a SCOTUS nominee from a president of the opposing party. And as long as the Senate and the president are of the same party, the opposition will deploy the same tactics Kavanaugh faced, only worse. Indeed, U.S. senators themselves may become victims of leaked info and character attacks in order to discredit their votes. What is at risk is the credibility of both the Senate and the Supreme Court. Justice Elena Kagan observed that the court’s power lies only in popular respect for the institution. If the nation sees the confirmation process as a nakedly partisan fight for power, it may eventually ignore the court altogether. Is it possible to stop the race to the political bottom and recapture the goodwill necessary for the Supreme Court and the Senate to function as the framers intended? Given the way Washington currently works, it is unlikely that Democrats and Republicans will call for a truce: Both parties are too beholden to special interests who benefit from the conflict. Which is where pro-lifers come in. As one of the most important special interest groups driving the current dysfunctional process, we could lay down our arms in an attempt to help fix the system, yes, but also to benefit our movement. As a pro-lifer who voted for George W. Bush in 2000 based purely on the hope of getting a court that would be friendly to pro-lifers, I understand the appeal of our SCOTUS battles. Roe and another landmark abortion case, Planned Parenthood v. Casey, mean that our side never gets to make a public case for serious abortion laws. As a result our abortion laws remain some of the most extreme in the world. But there are at least three reasons why it is in pro-lifers’ interest to disarm. First, the fight to overturn Roe/Casey has aligned us with the GOP, a poor partner in protecting prenatal children and their mothers. This partnership requires a total focus on abortion supply (laws making abortion illegal) but none on demand (laws, like paid family leave and the pregnant woman support act, which reduce the chance women will seek an abortion). We must find a way to work with both major parties to save the lives of prenatal children and support their mothers. Second, one never knows what a justice will do once on the Supreme Court. Many pro-lifers thought the fight was over when Anthony Kennedy was appointed, but his 1992 ruling in Casey largely kept the right to abortion intact. Many now believe Chief Justice John Roberts, as the new moderate swing vote, won’t overturn Roe/Casey, especially after the delegitimizing effect of the Kavanaugh hearings. And what will Kavanaugh do? Many believe he will respect Roe/Casey. That’s a major reason why pro-choice Republican Sen. Susan Collins ended up voting for him. Third, even if we are successful in overturning Roe/Casey, we are now almost sure to lose the legislative debates that will follow. Our association with Trump makes us deeply unpopular with the demographics who would be deciding such laws: young people and people of color. And what if Roe/Casey were overturned with the votes of one justice credibly accused of sexual assault and another of sexual harassment? It would no doubt be followed by huge numbers of women voting in support of abortion rights. Several pro-choicers I know actually want Roe/Casey overturned for precisely this reason: They believe abortion rights will be more secure after a legislative process. Bowing out of the SCOTUS wars may have another positive effect. In reacting to the naked politics of Roe v. Wade, and the pro-choice camp’s subsequent attempts to defend it, we have become one of the most significant forces pushing SCOTUS politics down its self-destructive path. Perhaps our disarming could ease some of the pressure on the system and lead other factions to follow suit. Someone has to be first. The alternative is doubling down on the current death-spiral — one that threatens the very existence of the Senate and SCOTUS as we have come to understand them.